This is one of the worst cards ever. Not only did All World do a bad job of a poor man’s Pro Set 1989, with its framing and stripes, they put two equally saturated colors (red and blue) up against each other on the type. The word ‘Rookie’ in cursive is just so 1990s…Not only is it not an action shot or a stoic pose, it’s of the player making stretches with a poor man’s skull cap on that looks like a woman’s stockings. Just a bad, bad, card. Kenton Leonard was not drafted by the NFL out of tiny Nicholls State University in Louisiana so he elected to fulfill his dream to play pro ball in the CFL. I don’t know what they put in the water in Louisiana, but the state just cranks out NFL talent like nobody’s business. (Nicholls State was also where notable LB Johnny Meads, OL Jay Pennison, and WR Mark Carrier went to college.) 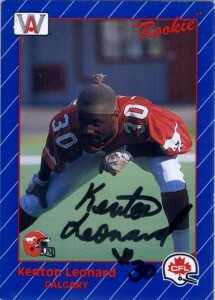 Kenton never let his diabetes stop him from playing defensive back for the Calgary Stampeders from 1991-1997 winning a Grey Cup with the team before retiring. Over his career he spent a lot of time talking to students about diabetes in Canada and helping raise awareness of the disease. He also has spent some time on the celebrity golf tourney circuit.